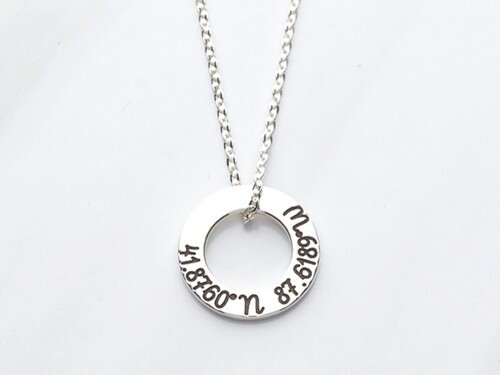 Hold a location dear with a skinny bar silver coordinates necklace that is perfect for layering with other necklace. 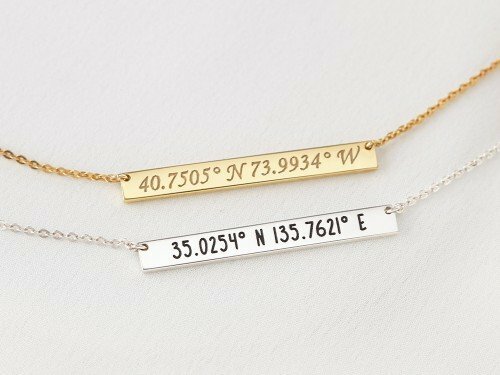 Engraved with GPS latitude & longitude of your choice, this sterling silver lat long necklace comes in silver and gold-plated silver. 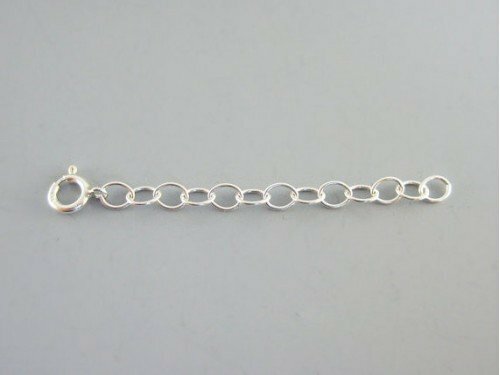 This delicate piece is very popular as an anniversary or wedding gift. 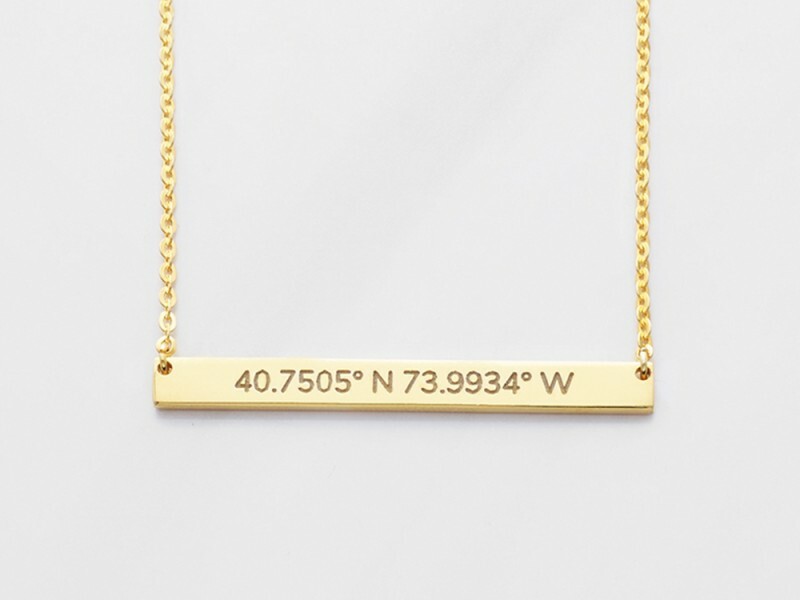 - We strongly recommend providing us the address instead of the coordinates as getting the correct coordinates could be complicated. 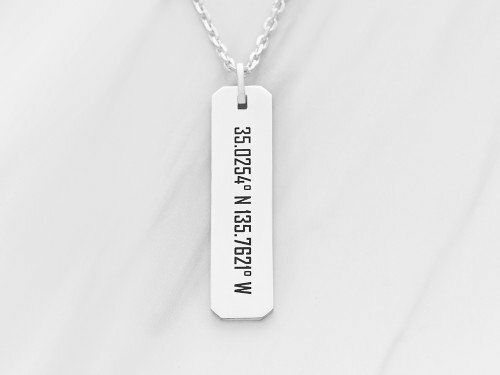 The address will be converted to GPS coodinates format as displayed. 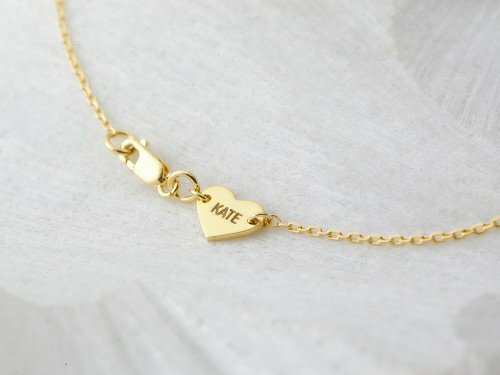 - Option to add a short message (3-4 words) engraved on the back. 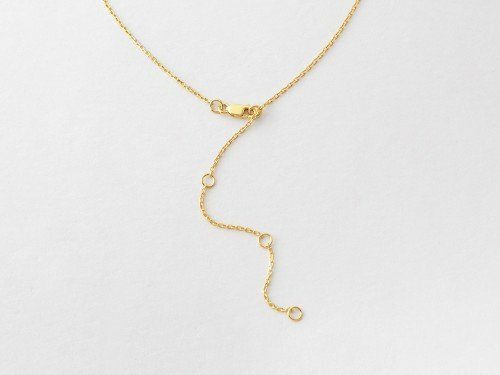 Materials Chain and pendant are 100% sterling silver and are also available with 18K yellow or rose gold plate. Accessory Product comes with cable chain and lobster closure clasp. Complimentary gift box. Allergy Product is safe for sensitive skin. 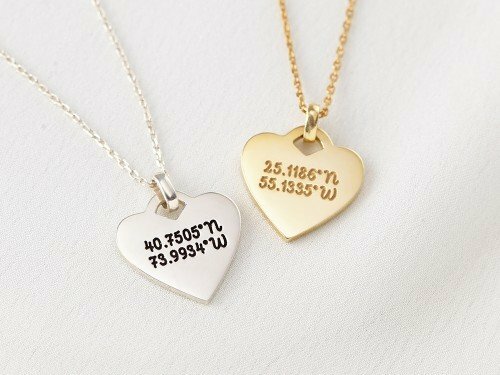 Engraving colors By default, engravings on yellow and rose gold items are left clear with no color fill and engravings on silver items come with a black finish. 1) Can you rush my order? Upon receipt of full payment and full personalization details, we will take 2-3 weeks to process and create your personalized and handcrafted jewelry. We cannot rush our production time, but we offer expedited shipping options. If you need something by a certain date, please let us in the “Instructions and Requests” field or email us at [email protected]. We will try our best to accommodate your request - but we cannot offer a guarantee as handmade process can be influenced by many factors that we cannot foresee. 2) Do you offer gift boxes? Every Centime jewelry item comes packaged in a complimentary gift box with care and cleaning instruction card. 3) What size should I order? Please refer to the size charts and guides that are linked at the bottom of our page. 4) I do not have images of the handwriting/fingerprint/signature/handprint or can’t upload them. You can place the order first without uploading any pictures, and simply email us the images and instructions for your order at [email protected]. 5) Can you combine multiple handwriting or signatures from different images? Yes we can do that. Simply upload the pictures and give us instructions on which word to use from which image and the order you would like. You can also place the order without uploading any picture - simply send the pictures and instructions to [email protected]. 6) Can you fix a spelling error or a word in my original handwritten note? Much as possible, we refrain from doing that except in exceptional cases where very specific instructions are given. One’s handwriting reflects precious memory, and we try to not to touch it. However, if you feel that it is important to change a certain word, contact us at [email protected]. 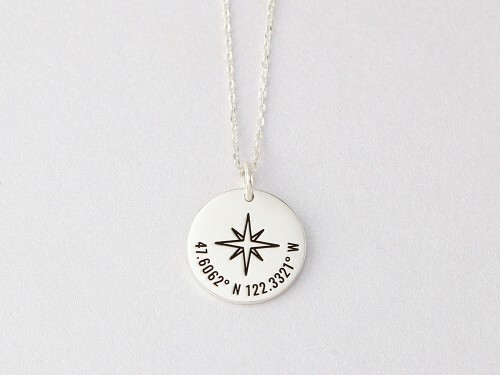 7) Can you engrave on the back side of the piece? 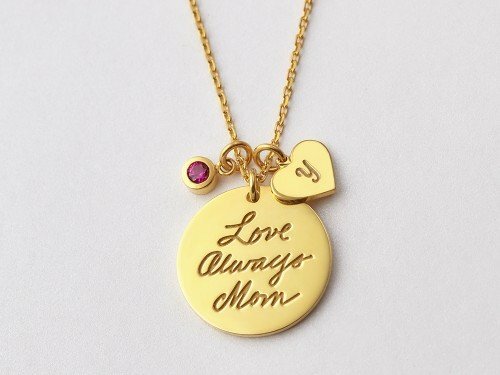 There are many designs that can come with option for back engraving. For others that don’t, please email us at [email protected] for a custom order. Please kindly understand sterling silver does get tarnished. How fast it gets tarnished depends on how you care for your jewelry and the nature of your sweat. However the good thing about silver jewelry is that when your piece shows signs of tarnishing, you can clean it with a polishing cloth or preferably a cleaning solution and it will look like new again. 9) I'm having trouble placing my order online; can you help? If you are having trouble placing your online order please contact us at [email protected]. If you are on the PayPal payment gateway site and you are receiving an error message, please try again later or contact PayPal Customer Service at 1.800.221.1161 (US) or the respective PayPal helpline of your country. 10) Is there a number I can call? We are sorry that we do not offer phone support at the moment. If you have any question, please email us at [email protected] and we will get back to you soon as we can, usually within 1 business day in off-peak season.